China explosion: A huge explosion rocked a chemical plant in eastern China on Thursday, killing 6 and injuring 12 others, reports said. The incident is said to have taken place around 2:50 pm at a chemical facility run by Tianjiyayi Chemical in Yancheng, Jiangsu province, officials said. 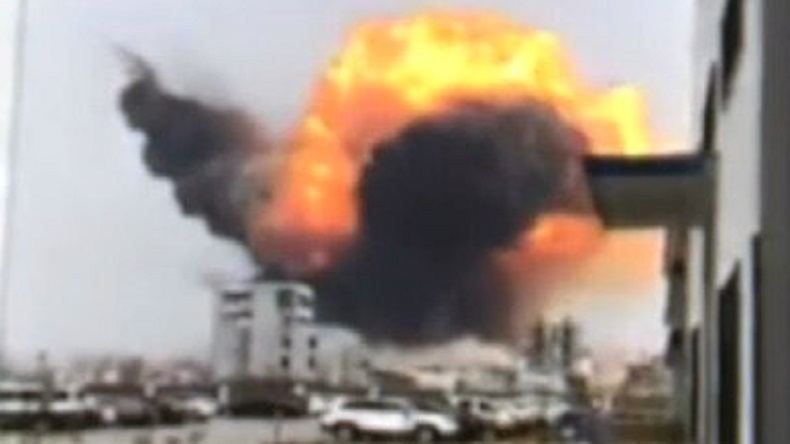 China explosion: A huge explosion rocked a chemical plant in eastern China on Thursday, killing 6 and injuring 12 others, reports said. The incident is said to have taken place around 2:50 pm (local time) at a chemical facility run by Tianjiyayi Chemical in Yancheng, Jiangsu province, officials said. The intensity of the blast did serious harm to local infrastructure as it shattered the windows of nearby buildings. An earthquake of 2.2-magnitude on the Richter Scale was also reported in Lianyungang, a town which is not too far from the blast site in Yancheng. The injured have been admitted to a nearby hospital for treatment, according to local authorities. In footage released by the state broadcaster CCTV, toxic fumes are seen coming from the blast site. The cause of the blast is yet to ascertained and investigations are underway. Medical staff and personnel of the local fire department are still present at the spot. China has a long history of industrials accident and many such incidents have been reported in the country in the last few years. In November 2018, a gas leak caused an explosion at a PVC production plant in a northern city. The incident had left 24 peopled dead and injured 21 others.